As we reported about it earlier, Marie and Per supported Musik Mot Cancer, a non-profit organization to raise money for Barncancerfonden Väst (children’s cancer foundation) and the children’s department of the hospital in Norra Älvsborg. They signed 3 guitars and some other Roxette and solo project related things. The end of the auction was on 16th November, on Music Against Cancer Day. Anyone could bid on all items from all around the world. The organizers first hadn’t planned with fans from abroad, but it soon turned out for them that there were many who wanted to bid mainly on items related anyhow to the Rox World. Musik mot cancer was very fast replying to all the questions regarding the auction and they also translated a huge part of their website into English to help foreign Roxers understand what was going on and how they could bid on guitars and stuff. The closure of the auction was organized as an event in Trollhättan, Sweden, where the guests could see all the items on display. The final bids could be taken in person, too, but the online platform was also available until the end of the auction. 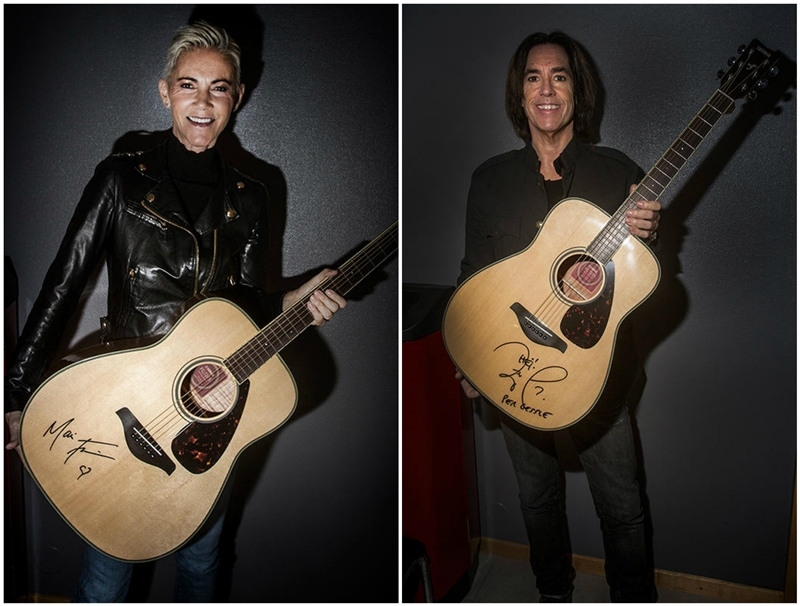 For a very long time it seemed that the guitar signed by both Marie and Per would be the one with the highest bid, but in the end it was Peter Lemarc’s guitar. Its final price was 25 000 SEK. The second highest final price was that of the Roxette guitar, 20 000 SEK. Interesting info is that the winning bid for the Rox guitar (besides the guitars signed by Håkan Hellström and In Flames) came from Folke Pettersson, from Lilla Edet. He says he comes from a musical family, but he was bidding mainly because he finds the cause very important. The guitar signed by only Per was auctioned for 9 000 SEK, the one signed by only Marie for 7 000 SEK. From the total of 83 items on auction 16 was related anyhow to the Rox World. Musik mot cancer collected 270 000 SEK to help the fight against cancer. 17% of this amount of money comes from items signed by Marie and Per. What a fantastic result! The final prices for each item you can check HERE. Congrats to the organizers! Wishing them as much success with their future projects as they had with this one! Huge thanks to Marie and Per for supporting such a great cause and to all the participants who with their bids helped to raise this much money!